Last year, while passionate people dedicated to space travel solved technical challenges using data and science, America left many earthbound problems unaddressed because the political right remains allergic to facts that conflict with ideology. Last year, the stock market soared to record heights. Drug deaths also soared, fueled by an epidemic of opioid addiction. Seattle’s real-estate market was the hottest in the nation, and its homeless population boomed, too. This year, I hope America gets better at dealing with humans and improving the social systems that determine how well we do, individually and collectively. We know how to get things done when we really want to do them. 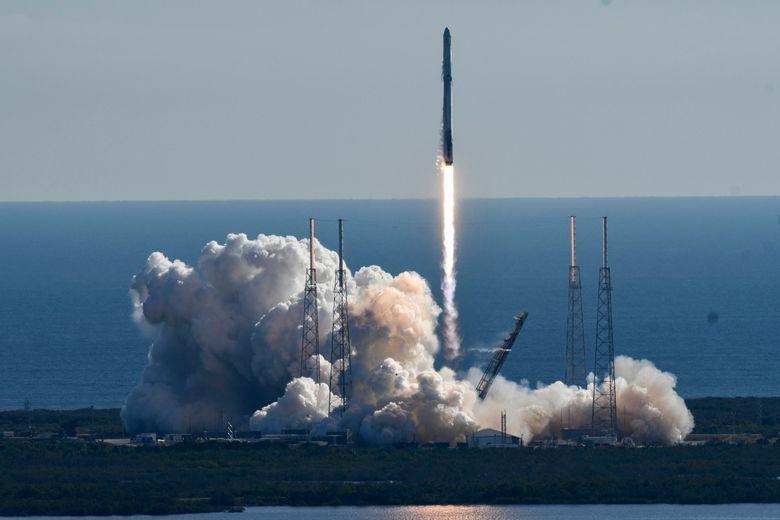 Last month, SpaceX launched a reused space capsule atop a reused rocket, a technical achievement that will dramatically lower costs for getting into space. That’s great, and it happened because it became a priority for some very focused people, including a passionate billionaire, Elon Musk. Making spacecraft reusable was a difficult problem to solve, but we face some harder ones that could benefit from intense focus. It’s a new year, but we’ll drag into it a lot of problems that result from failing to deal with old business. Like most people, I did some looking back over the past few days, and that’s something that stuck out in stories about the year and in my own columns. We let a lot of problems linger, unsolved. I wrote about climate scientists struggling to make people aware of global warming without wading into politics, an almost impossible task since politics has come to define where Americans stand, even on issues where facts are clear. Conservative Republicans and liberal Democrats are at opposite ends of the spectrum of opinions on whether human activities are causing climate change. The science of global warming has been clear for years: The climate is warming, and human activities are causing that rise. The U.S. has never moved as fast as it should to slow, or prepare for the worst consequences, of climate change. People are notoriously bad at time, effort or money on problems that lie in the future. But now that climate change is already affecting the planet, the U.S. has a national government that refuses to see the problem. So, this year, the problem of coaxing awareness and action remains. That can be said about many other issues, as well, from access to affordable health care to efforts to reform police practices to immigration policy. This is going to be a challenging year for people who believe our society hasn’t gotten to equality yet. Polls and surveys show wide differences by party on questions of racial and gender equality. We don’t seem to be living on the same planet anymore, and that is partly because we are inundated with information, much of it from sources that are biased. I wrote about efforts to combat “fake news” and to help young people learn how to distinguish between sources that make an effort to adhere to the facts, and those that put ideology above truth. That’s a huge problem. There’s no way to have a civil discussion when people can’t agree on what’s true and what isn’t. People at any point on the political spectrum can be limited by information bubbles, but, for now, Americans who are furthest to the right are most often furthest from the facts. That hasn’t always been the case. I remember when conservative and sensible could be used in the same sentence, but today we have a problem. It is the political right that makes it difficult to gather data on gun deaths and rejects what data there are in favor of a belief that more guns will make everyone safer. I thought the shooting deaths of 58 people at a Las Vegas country-music festival in October might make a dent in that belief system, but it didn’t. Before we can address all the social problems we still face, we’ll have to find a way to a shared body of facts. No one could launch and recover a rocket if they ignored the facts, the data, the calculations that make that effort possible.